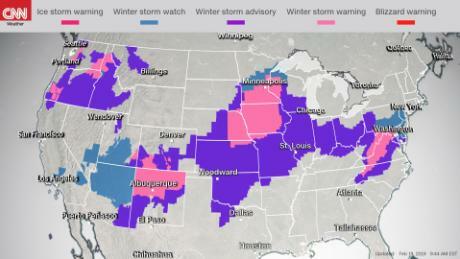 More than 90 million people from the Plains and Midwest to the Mid-Atlantic and Northeast are under some sort of winter weather watch, warning or advisory. 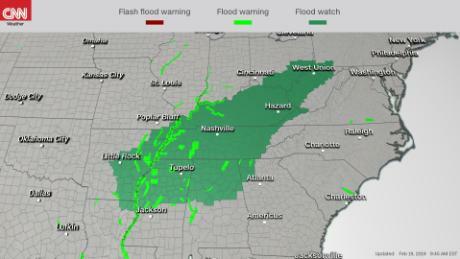 Nearly 20 million are facing a flood warning, watch or a flash flood watch across the Southeast. Warm moist air streaming north from the Gulf of Mexico will combine with a colder storm system exiting the Rockies to create an expected wintry mix Tuesday night into Wednesday. • Winter weather advisories are out for Oklahoma City; Wichita, Kansas; the Kansas City area, St. Louis; Chicago; Milwaukee; Indianapolis; Louisville, Kentucky; Cincinnati and Columbus, Ohio; and Pittsburgh, where light to moderate, snow or ice is forecast. • There are winter storm warnings for Omaha, Nebraska; Des Moines, Iowa; and Minneapolis, where up to 9 inches is expected to fall. • Snow and ice will cause problems for the Baltimore and Washington areas. Four to 6 inches of snow and sleet are expected in both cities, with wintery weather starting overnight and lasting into Thursday. As warmer air mixes in, ice accumulations of a 10th of an inch are possible. • Winter storm watches with heavy snow or ice are expected from Philadelphia northward to west of New York City. Some to 2 to 3 inches of snow could fall. New York will likely see snow Wednesday afternoon before it transitions to rain by the evening. • If you are a student in the School District of Philadelphia — the nation’s eighth largest by enrollment — you can stay home Wednesday. If you work in an administrative role, the decision whether to open offices will be made by 5 a.m. Wednesday. If you are a building engineer, the district says to come to work. • A moist warmer air mass will allow for extreme rain Tuesday through the end of the week from the Ohio Valley into the Southeast. Flood or flash flood watches will extend from northern Alabama and Mississippi northward to West Virginia. • Two to 4 inches of rain is expected across the region, with even higher amounts of 5 to 7 inches in Memphis and Nashville through the end of the week. • Multiple rounds of rain will affect North Georgia this week. Cities such as Atlanta are likely to receive 2 to 3 inches of rain, and even higher amounts are expected in the mountains to the north. CNN’s Dave Hennen and Chuck Johnston contributed to this report.